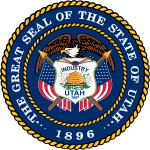 The 2012 Utah gubernatorial election was held on November 6, 2012. It was won by Republican incumbents, Governor Gary Herbert and Lieutenant Governor Greg Bell. ^ a b Gehrke, Robert (December 19, 2011). "Retired general poised to take on Herbert in gubernatorial race". The Salt Lake Tribune. Retrieved December 20, 2011. ^ a b c d Gehrke, Robert; Canham, Matt (April 21, 2012). "Herbert wins nod, Philpot feels betrayed". The Salt Lake Tribune. Retrieved May 10, 2012. ^ Meyers, Donald W. (January 18, 2012). "Utah tea party founder Kirkham takes on Herbert". The Salt Lake Tribune. Retrieved January 19, 2012. ^ Hesterman, Billy (November 30, 2011). "Philpot to challenge Herbert in 2012". Daily Herald. Retrieved November 30, 2011. ^ Davidson, Lee (November 11, 2011). "Utah governor faces challenge from inside the GOP". The Salt Lake Tribune. Retrieved May 10, 2012. ^ Roche, Lisa Riley (November 10, 2011). "GOP lawmaker to run against Gov. Herbert". Deseret News. Retrieved May 10, 2012. ^ Romboy, Dennis (November 14, 2011). "Sandstrom announces bid for Utah's new congressional district seat". Deseret News. Retrieved November 14, 2011. ^ Roche, Lisa Riley (June 9, 2011). "Two Utah political heavyweights eyeing key races". Deseret News. Retrieved June 10, 2011. ^ a b "Election Results: Utah Governor's Race". Utah Republican Party. April 21, 2012. Retrieved May 10, 2012. ^ Isenstadt, Alex (December 15, 2011). "Matheson to run for reelection". Politico. Retrieved May 10, 2012. ^ Toeplitz, Shira (December 15, 2011). "Matheson to Run in New Utah District". Roll Call. Retrieved May 10, 2012. ^ Gehrke, Robert (April 19, 2012). "Rampton named as Peter Cooke's running mate". The Salt Lake Tribune. Retrieved May 10, 2012. ^ "2012 Candidate Filings - Lieutenant Governor's Office: Elections". Elections.utah.gov. 2012-04-26. Retrieved 2013-02-05. ^ Ken Larsen Free Speech Message. "Ken Larsen". Vote Utah. Retrieved 2013-02-05. ^ "Why Choose Rob? « J. Robert Latham | Attorney at Law". Jrobertlatham.pro. Retrieved 2013-02-05.